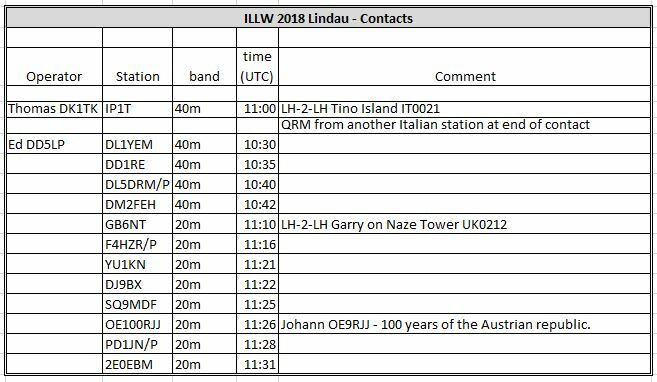 ILLW 2018 – Lindau Island. 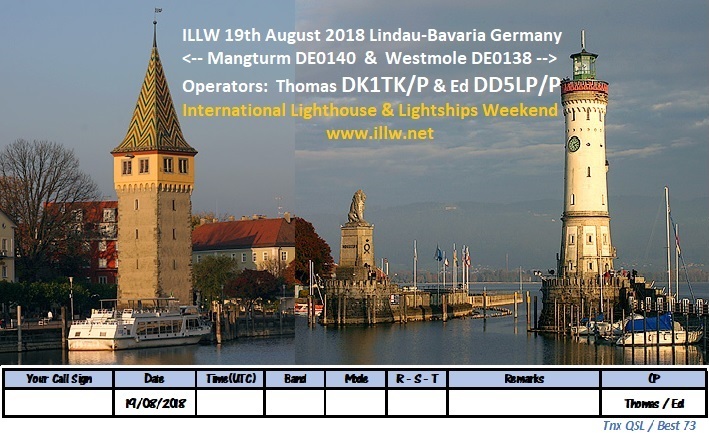 I (Ed DD5LP) and Thomas DK1TK activated two lighthouses on the Lindau Island in Lake Constance on August 19th as part of the International Lighthouse & Lightship Weekend. I registration number was 300 and lighthouse numbers DE0138 and DE0140. The Lighthouses are the Mangturm which came into service in 1230 (and hence is the oldest lighthouse by far in the ILLW) and the “New Lighthouse” on the West Mole which took over service from Mangturm in 1856 and is the most southern lighthouse in Germany and is different to other lighthouses in that it has a clock built into its land facing side. On July 30th. I met with the council for authorisation to set up a station in the “new” Lighthouse on Westmole (DE0138) however after visiting the lighthouse I found that there was only limited space and a second “reccie” took a look at the alternatives on August 6th. One possibility, near the Bavarian Lion statue was also ruled out and the end decision was for the Roemerschanze Park which lies between the two lighthouses. I then obtained permission from the council to set-up in this park. In preparation prior to the event I created a QSL card design and some portable log book pages. The Mangturm (DE0140) was built in 1230 and was one of the towers marking the borders of the free city of Lindau. It takes its name from the clothing plant that used to be alongside it “Mang” from the mangles used to squash the material flat to remove water and ‘turm” simply means tower. Originally it could only be reached by boat however nowadays it sits proudly on the harbour front next to where the ferries arrive. Originally built as a lookout and signalling tower it later took over the role of lighthouse until it was replaced in 1856 by the new lighthouse on the Westmole (the western harbour wall). After going out of service as a lighthouse the Mangturm was given a new pointed roof of mirrored tiles and now serves as a community meeting place and is often used for children’s story telling. The Westmole lighthouse is different to other lighthouses in that it has a clock built into one of its walls that can be seen from the town. The Westmole light at Lindau on Lake Constance is the southernmost lighthouse in Germany and receives many visitors each year not only to climb to the top for the wonderful views but also to read the plaques and see the paintings on the inside of the walls. Our location for the ILLW was in the Roemerschanze Park which is on the eastern side of the harbour in full view of both lighthouses and is visited by tourists ion their way to the Bavarian lion statue that sits across the harbour entry from the Westmole lighthouse. Conditions at Lindau were terrible with S7-9 electrical noise on 40m and some also on 20m. QSB on bands taking stations from S8 to nothing in 5 seconds! We talked to a few passers-by about the light houses and amateur radio which is the aim of the event in any case. Both Thomas and I only managed one Lighthouse contact each. The rest of my contacts were chasers – either home stations or portable – we had one WWFF activator. Thomas (DK1TK) who was with me managed a contact with an Italian lighthouse IP1T but it was cut short to a basic contact by another Italian station came on frequency and blocked everything out. I spent the first 15 minutes calling PA6VEN – Melvin at NL-0035 but without getting through because of all of the non-lighthouses calling him. Later I did manage my one L2L contact with GB6NT on 20m. The 20w Xiegu X-108G that I use gave me some problems, reading the screen was difficult in the sunlight and the defunkt button cell battery that powers the temporary memory meant that not only did the rig forget the time (not so important) but also what frequency you were on when you last turned the rig off (which with the way you tune the rig was rather annoying). Even my little sunshade that I have to try to make the display readable, caused problems. It knocked the power setting buttons, so that at one point I was only running 0.5 watts, no need to say I didn’t get many contacts with such low power on a busy band. In fact between my Xiegu and Thomas’s KX2, my linked dipole and his end-fed, we had real problems getting any contacts to start with. It was probably nearly an hour until we managed the first contact. We tried calling several other lighthouse stations but we could forget that approach as all the other chasers were running power and stomped on us. I had a problem with spotting to the DXCluster because the program on my phone would truncate my frequency entry until I realised it needed me to type in the kHz not MHz. Spotting to the ILLW page didn’t seem to bring any calls. Once I had the Xiegu on a free frequency though, we were getting better reports than we were giving – which I put down to the background noise that we had at our end. The 20+watts of the Xiegu does seems to get out OK when everything else is right. Prior to this activation I thought I had found a solution for the display readability but that doesn’t seem to be the case – perhaps the actual display is faulty – I can’t think that all Xiegu’s are like this one – it’s unreadable in any level of outside light! The gummi-like buttons on the rig will send me crazy as they don’t work 80% of the time – there has been a mod published to replace them with “real” buttons, perhaps I should look at that. Once set-up the Xiegu performs but it’s getting it set-up that can be a real pain. Thomas also tried 10 metres and found a fair amount of activity with no interference. I’m not sure whether any of the 10m stations he heard were lighthouse stations, I think rather not, but it was interesting to hear such clear strong, consistent signals on 10 metres when the other bands in general were very bad. A nice event to take part in. 2.5 hours activation was probably as much as the two of us could manage because of other commitments. This event is more suited to clubs however, taking part for 12, 24 or the full 48 hours. I still have work to do on the Xiegu X108G to make it easier to use. All in all an enjoyable day out and Lindau is a beautiful town to visit especially in the sunshine as we had.